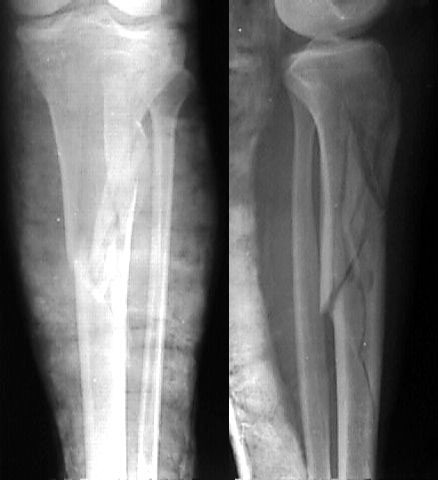 I amseeking advice management of young male motorcyclist who has sustained highenergy direct impact to his right shin resulting in closed highly comminutedfracture of his right tibia. (See attached xray). He also has fracture of his rtlateral malleolus not shown on attached xray. Is interlocking nailing an optionor it has to treated conservatively ? Dr. Rajat Varma FRCS, Varma Union Hospital, Indore, India. This is a difficult fracture. I would reduce and fix the tubercle (minimalopen vs percutaneously) and put the patient in an Ilizarov. The fracture is tooproximal for a nail. I think IM nailing of this fracture is not very easy, you have a highcomplication rate even with a very experienced surgeon we would treat thisfracture with a plate ( as long as soft tissues allow us to do so) perferably apercutaneous plate or a LISS plate with angle stable screws. A nail would need additional blocking screws to improve the stability , and itmay be wise to start with two srews in the proximal tibia to be sure that thesplit is not dislocated during the nailing. Ace or new Richards nail with a small Herzogs curve will fit this nicely, butthe starting point will have to be just distal to the meniscal edge, just likeDean Cole shows. 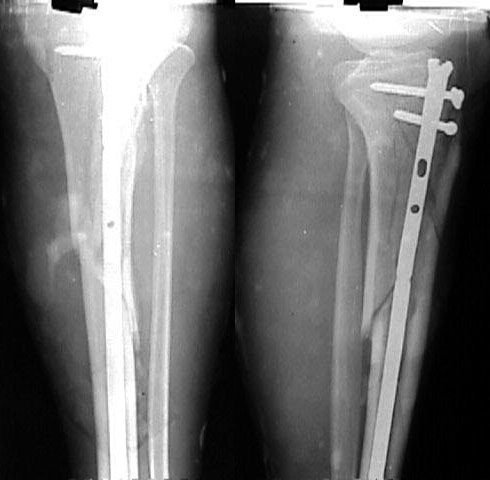 Heck, dean fixes Tibial plateau fractures with nails. You mayhave to hang the leg from a distal femoral traction pin and a hook in the ceilingto hyperflex, but it works well and the patient would be able to walkimmediately. A hybrid will cause the knee to get infected as the pins will haveto be too high and result in a pin tract infection within the joint capsule. This fracture has a split that goes up into the joint on the lateral view thatwould displace upon nailing. The technique described is probably possible, butextremely demanding. For the rest of the world that isn't the distinguished Dr.Sanders or Dr. Cole, I think a non-medullary solution is the way to go. Platingis an option as long as the medial side is handled in a biologically friendlymanner. A hybrid frame would probably not provide the stability you need over thelong metaphyseal/diaphyseal segment. A full circular frame would be more stable.If the proximal end is stabilized with screws, the wires will not need to be inthe knee capsule. Dr. M. P. Shrivastava, Kathmandu, Nepal. Definitely you can nail it. Also can be treated conservatively. Conservative treatment will do fine. Watch out for the neurovascularand soft tissue compression syndromes. i am not that distinguished. Anyway, I think that the nail, with blockingscrews and lags would work well. I dont understand why a hybrid, even a longhybrid wouldnt work, and I also think that a perqutaneous plate slid along theshaft and fixed with flouro would do just fine; I am just trying to see whichmight be the most satisfactory treatment for a center outside the U.S. Thefracure is not easy to treat. Thanks all for your suggestions. I elected to do closed interlockingnailing - the operation I am most comfortable with. The skin was blisteredthroughout the leg so open plating was not an option nor conservative treatmentas dressings would have been a nightmare in plaster. I used Indian madetibial nail ($30! ), customised it by decreasing the herzog bend and adding twomore holes in the nail proximally which I locked with free hand technique. The post op xray is attached. Rajat Varma FRCS, Consultant Orthopaedic Surgeon, Indore, India. > be able to walk immediately. A hybrid will cause the knee to get infected asthe pins will have to be too high and result in a pin tract infection within thejoint capsule. If it even happens sometimes AFAIK the cases are rather rare. I mean infectedknee. Usually appropriate number of well tensioned opposite olive wires providesenough stability to prevent infection. Check for instance this paper: M.Morandiand M.Pearse (1996) Management of Complex Tibial Plateau Fractures with theIlizarov External Fixator, Techniques in Orthopaedics 11(2): 125-131. They met nosuch complication in 50 cases, despite they used even smooth para-articularwires. The case seems to be ideal for circular or hybrid frame. 5-6 olive wires intoproximal epimetaphysis, 1 olive half-wire to tuberositas tibiae, two pairs ofwires or 2 half-pins + 1-2 wires below fracture site are secured to 1 ring or arcabove fracture and two rings below, bridging the comminution level. Because offracture pattern only stress shielding is needed. Small intermediate fragmentscan be hold in place by half-wires. Had the patient no malleolar lesion fullweight-bearing could be allowed since 1st post op day. If appropriate equipmentis unavailable around IMHO the case can be successfully managednonoperatively. Nice case, and nice result (early). Where can we order some of those $30.00nails? i rest my case. good job.